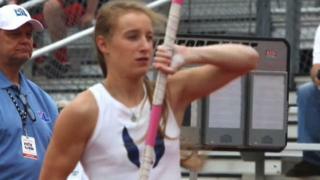 Blind pole vaulter Charlotte Brown clears 3.5 metres to win a bronze medal at the Texas state high school championships. Brown, who received a standing ovation from several hundred fans, says her achievement is about "finding something that makes you happy despite whatever obstacle is in your way". Brown was joined on the podium in Austin by her guide dog Vador. Click here to find out more about getting into disability sport.